Speaking of Quantum Flirts (we were, weren’t we? ), I got socked with another one this morning. This one was in the form of my favorite comic in the world – Mutts™ by Patrick McDonnell – and featured Mooch the dog reveling in a downpour while his human trudged under the umbrella. There’s something that happens when a Quantum Flirt captures your attention. There’s a resonance somewhere in your body that says, “oh, this is so true and rich and real.” And if you actually take the time right then to see what unfolds, you nurture the awesome potential of that moment, that Flirt, to provide you with a new insight, to trigger an “aha,” or to help clarify your thinking. What’s not to love? Not familiar with Quantum Flirts? Read my last blog, “Flirting … in a quantum sort of way.” That may help. But in a nutshell, a Quantum Flirt is a short-lived signal – something we suddenly see, hear, smell, taste, notice in some way. The object captures your attention at that point in time. It’s up to you to let it slide away or to decipher and figure out what it might mean for you. Anyway, back to Mooch and Mutts. I think I experienced a double flirt. First was the moodiness of the image and the pure and unadulterated joy of Mooch’s gyrations in the pelting rain. Did he care that it was raining? Not at all! He was simply enjoying being alive, cavorting, maybe even choosing to enjoy the raindrops. Second was the quote from Longfellow. Oh, that sealed it. When it’s raining, let it rain. It made me stop and think. Yeah. How true is that … on several levels. In the winter, we complain there’s no sun and it’s too cold. In the spring, we complain that it’s raining or that winter is hanging on and there’s no sun. In the summer, when the sun beats down mercilessly and the rain is nowhere to be seen, and the grass is browning, and the temperature chases us into our air-conditioned homes, we long for cooler weather. In the fall, when cooler weather arrives and life winds down for a hibernation, we lament the coming cold weather and mourn the loss of the heat we were just bitching about. Are we never happy in the moment? When it rains, can we not just let it rain? And when it snows, can’t we simply let it snow? Can we enjoy the fact that we’re in the moment, alive, and like Mooch, out for a walk with our human and content to be? So, how does that flirt actually inform my thinking? Well, I think it put something into perspective for me. A friend of mine was talking about a moment in time when everything just seemed crappy. In one day, injury struck, personal unhappiness struck, medical bills struck, financial issues struck, stress struck, and moving forward seemed harder than hell. Wow. That’s a tough place. My impulse is to help find solutions, to help make it better. It pains me, too. So I did try even though I could hear, in her voice, the unmistakable overload that seems to be saying, “I hear you but I’m not really listening. I can’t right now.” I know how that is, and I wish people would leave me alone when I hit it. 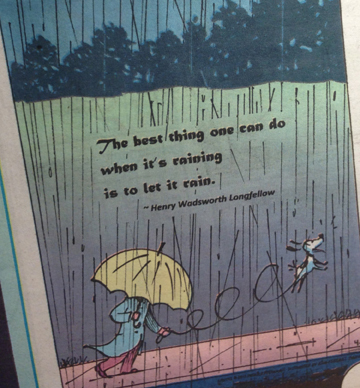 Enter my Sunday morning Flirt – seeing Mutts and reading Longfellow in the Sunday comics. After the prickle of goose bumps (a sure sign that something very elemental is at work), I stopped to allow this moment – this sign – to unfold. Rain is what it is, just as reality is what it is. If I don’t fight it, but simply let it rain, how much better I ultimately am. I detach a little. I get on doing the next thing and the next thing rather than dwelling on the rain and how I feel about it. And the rain eventually ends. The sun comes out. It dries up. It reminds me a lot of Constructive Living, an Eastern philosophy that makes a lot of sense to me. So what I can do, whether it’s me in the rain or me watching someone else in the rain, is to let go and “be” and let it rain. To experience the rain. What I can do for others is to be there with them in the rain, where it’s uncomfortable, and also with them when it’s not raining and the sun’s shining, where it’s infinitely nicer. Sometimes it’s best to just sit there in that moment and experience it, and not worry about making it better right then and there. I think my friend is wise, too, because about a week afterward, she told me pretty much the same thing as my Sunday morning Flirt, adding that she actually needed to stop for a bit, to slow down. Painful as it was, her situation forced that to happen. I got that, but it took Mutts and Longfellow to memorably drive it home. Maybe the universe sent me that Flirt for just that reason. It’s my interpretation, after all.